Turtledove, Harry. 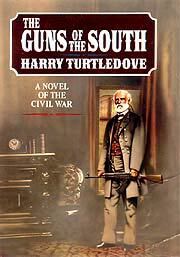 The Guns of the South: A Novel of the Civil War . Ballantine 1992. What if: The Confederacy obtained advanced weaponry just before the Wilderness. Summary: Afrikaaners from 2014 provide the CSA with AK-47s, etc, leading to Confederate victory in the U.S. Civil War, but strings are attached to the gift. Published: Ballantine 1992 (0345376757); Ballantine/Del Rey 1993 (0345384687BUY), 1997 (0345413660BUY); and SFBC 1993. Published: Excerpt "The Long Drum Roll", in The Fantastic Civil War (ed. Frank McSherry, Jr.), Baen 1991 (0671720635BUY).